My wife and I have been travelling for a few days now. Before arriving in France, we spent a few days with old friends in Banbury, UK, and took the opportunity to take the train into London for a couple of days and play tourist. We got to our B&B – Les Cèdres Bleu – in Lièvin, Frnace last night around 8PM CET (0600z), and were quite happy to have such a beautiful place to stay in the area. When we left the B&B in the morning to head to Vimy Ridge, our route took us through the residential area of Lièvin. Along the road, taped to nearly every home and building was a Canadian flag. Anyone who’s taken Canadian History in high school has been told of the Canadian contributions to both world wars, but it is another experience entirely to see the people of a town liberated by the Canadian Forces fly our colours as a sign of lasting gratitude. 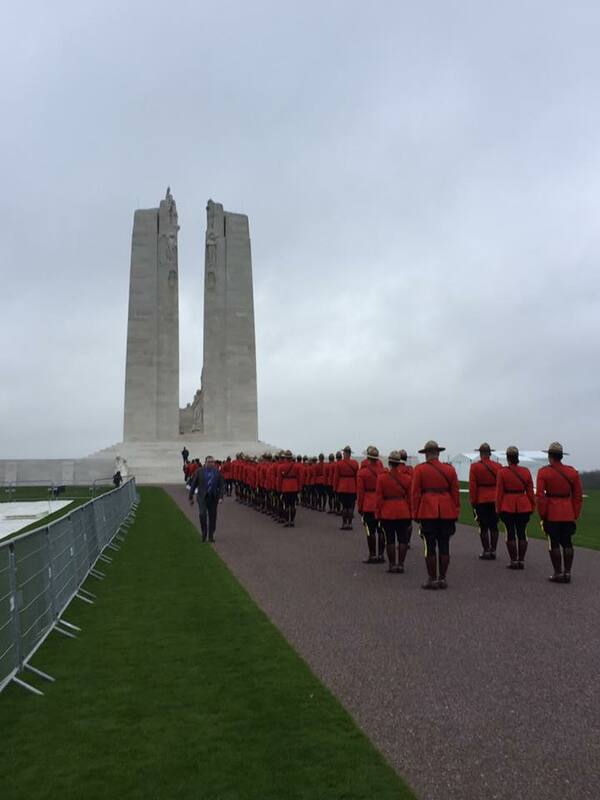 Even more sobering was realizing just how close we were to Vimy Ridge itself – the journey from our B&B to the memorial site was only 5.6km. I got to the TM100VIMY operating site at 7:30AM CET (0530z) and was met by Keith Whitney, VE7KW, Chris Allingham, VE3FU, and Frank Davis, VO1HP. Keith showed me around the antennas and the 2 stations they had setup – Elecraft K3’s, KPA500’s, KAT500’s and laptops running N1MM+ for logging. For antennas, there were a couple of Spiderbeams, and some wires – dipoles and verticals. Chris and Frank were operating CW, and there were a few thousand contacts in the log. Frank took a break to let me in, and I ran on 40m for 1.5 hours to get broken in. 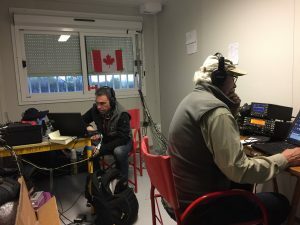 I’ve never operated outside of IARU Region 2, so this was definitely a new experience. 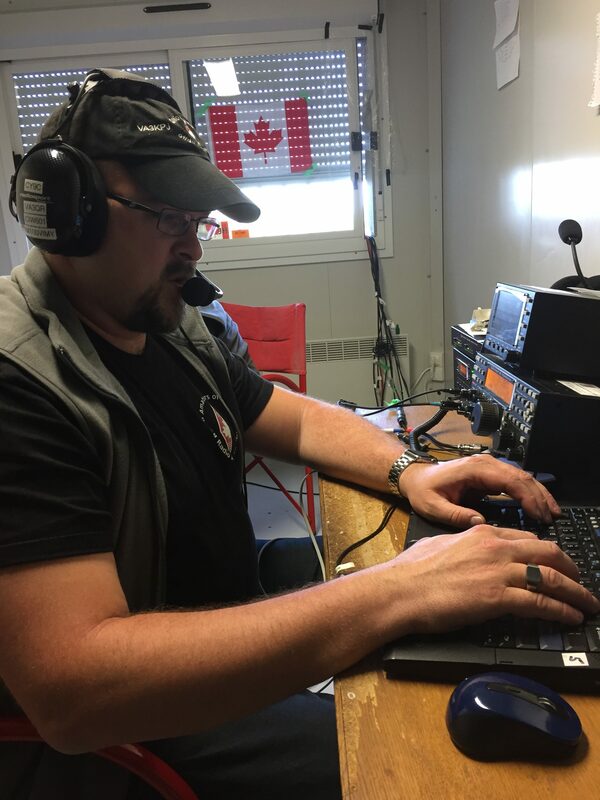 One of the funny side-effects is that, since TM100VIMY is a French callsign, French stations calling me seemed to assume that I could speak the language (and my wife will very clearly tell you that my French is awful), so it was a bit of a challenge to muddle through the callsigns. It’s a very busy place outside the operating building – crews are getting the grounds ready for the as many as 25000 visitors for the April 9th event to commemorate the 100th anniversary of the taking of Vimy Ridge by the Canadian Forces. Access to the memorial site is being closed to the public starting tomorrow to give the workers a chance to complete all the necessary preparations. My operating shift ends at 3:30PM CET (1330z), at which time Cassandra is going to pick me up and we’re going to walk the Vimy Memorial while it’s still open. I don’t want to miss the opportunity to see this place while I’m here – it’s too important to our history. I hope to hear you down the log while I’m here. 73 for now!